Lacerte Family Children’s Zoo goats explore the tiger viewing area on a recent adventure! Animal Care Supervisor Lisa Van Slett Guest Blogs on ZooHoo! For most people, taking your dog for a walk is a common event. It feels natural to say that your dog (and you) need exercise to stay in shape. Beyond good exercise, these walks are also a way for you to bond with your four-legged best friend. But what about other animals? While we are limited by species at the Dallas Zoo (I would not recommend walking your giraffe around Oak Cliff), the Lacerte Family Children’s Zoo has room to roam. On any given day you may find the keepers walking goats, sheep, pigs, chickens or our longhorn! Upon first glance walking these animals may seem straight forward, but there is more to it than meets the eye. Our keepers start training the animals with the basics, like getting comfortable with wearing a harness, halter, or collar. Just like people, individual animals have different levels of confidence. Sometimes we get lucky, and a goat is comfortable wearing a collar right away! Other times we have to build up to it, which is when the relationship between animal and keeper is vital. We use positive reinforcement to build those strong relationships and earn the animals’ trust. Once they are dressed and ready to go, we can start exploring the Zoo! 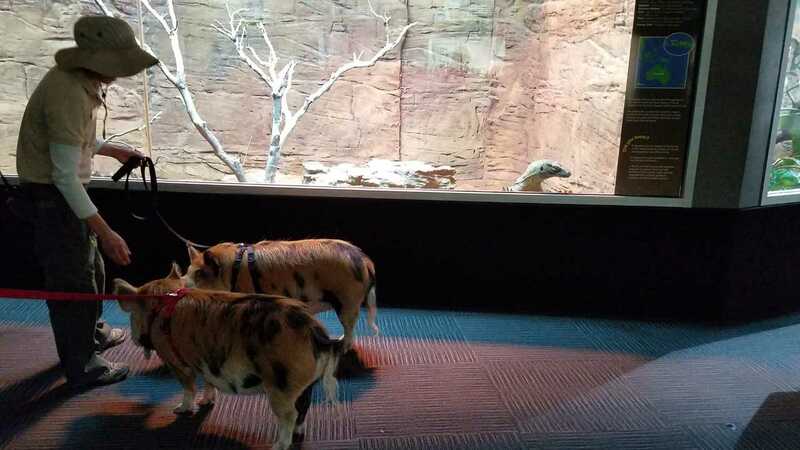 Penny and Oliver say hello to the Komodo dragon in the Herpetarium. Another less obvious benefit of walking our animals around different parts of the zoo is how enriching it is for everyone involved. The animals get to see and explore something new, and it’s also fun for guests at the Zoo! Although you can go into our contact yard with the animals, there is something very special about bumping into them somewhere unexpected. 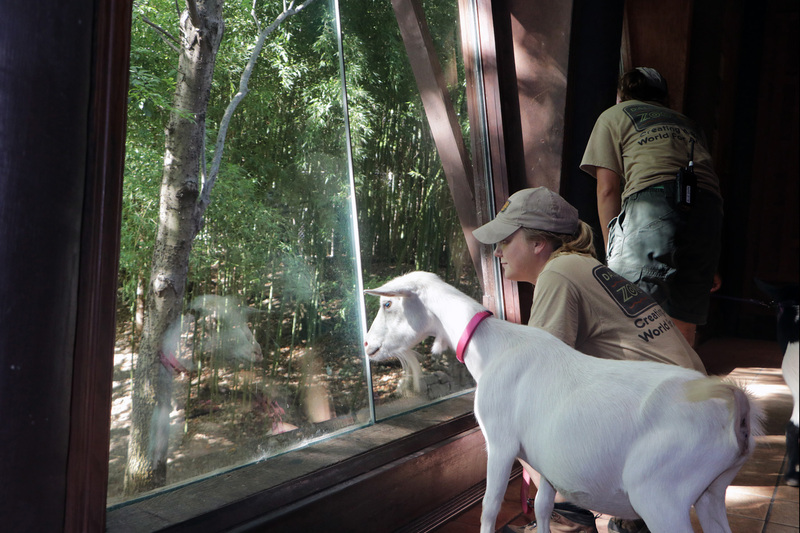 The keepers get just as excited and request that we call them to tell them when the goats are coming for a visit! We also love seeing the reactions of the other species. The penguins and otters are always curious. Killa, the harpy eagle likes to watch the goats, and the Komodo dragon comes to the glass to see the pigs up close. Keepers have a lot of factors to consider when deciding which animals to take out and what destination to pick. For instance, our goat herd contains 11 goats! As fun as that would be to walk the whole herd, we mix and match within the group, and only take out two or three at a time. Our Kune Kune pigs, Penny and Oliver, are always a big hit too. They are both halter training and can usually be seen walking within the Children’s Zoo, but occasionally you might find them out in ZooNorth. They have even made appearances in the Herpetarium! The sheep are our most adventurous animals. They have gone through the tunnel to the Wilds of Africa to visit the lions, cheetahs, mandrills, and penguins. Everyone comes out to take a look! Bahati the lion took a seat at the window, sitting as close as she could to the sheep. Mshindi the chimp likes to look at the chickens and watch as they walk around. There are endless possibilities for adventure and exploring with our contact animals. If you would like to see our animals in action, there are several options. You can come for a visit on Monday, Thursday or Saturday around 10-11 am (weather dependent) when we have our scheduled goat walks. You may also see the sheep greeting guests as they come into the Zoo during our monthly Dallas Zoo Member Mornings. However, on the nicer days you never know what (or who) you may see around the Zoo during your visit! 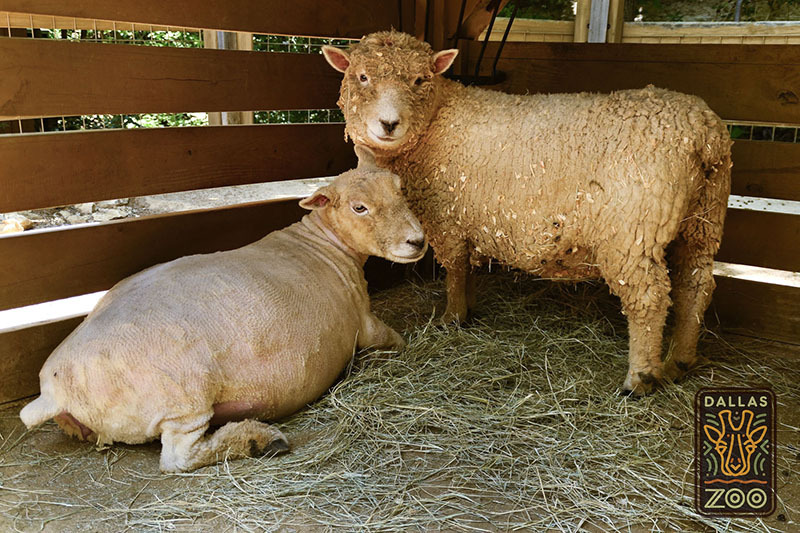 With bikini season in full swing, our four resident sheep have shed a few pounds – 8 pounds of wool, to be exact. Mary, Matha, Alice, and Herbert look a little lighter than usual in the Lacerte Family Children’s Zoo farmyard. To keep them cool and comfortable during warmer months and to prevent their hair from covering their eyes, they are carefully sheared twice a year. Summer temperatures have been known to get as high as 110 degrees in Dallas, and that’s too warm if you’re wearing a wool coat. But it’s not as easy as getting a haircut. Each sheep was bathed with a special lanolin shampoo a day before so its thick wool could dry completely before shearing. With the help of our Junior Zookeepers, all of the dirt, pine shavings, and hay that had hibernated into their wool was removed. The next day, one by one, the sheep were brought into the barn for a gentle trimming with electric clippers. Unlike commercial farms, where shearing is done quickly, our staff takes their time to ensure that it’s a good experience for the animals. Ours also don’t have as much wool as other species of sheep, because they’re one of the smallest breeds, often called miniatures. Known as Babydoll Southdown sheep, they’re one of the oldest English breeds, originating in the South Down hills of Sussex County, England. And they produce some of the best wool — their fleece is so fine, it’s put into the class of cashmere. Sheep Mary relaxes after her shearing; Alice waits for her turn.